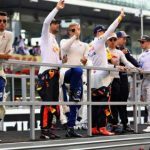 F1 2017: Who is driver of the year? Is the best driver of an F1 season the world champion? The surprise package? Or the driver who gets more than expected out of his car? It’s an annual debate at the end of each and every F1 campaign and one which does not always meet with consensus given a driver’s results hinge just as much on his car as their own personal performances. But we want to know who YOU think has been the best pound-for-pound performer in F1 this year. On the Sky Sports website and mobile app after every Grand Prix, each driver is given a mark out of 10 by the digital team for their performance that weekend in a Driver Ratings feature that never fails to split reader opinion. The drivers’ average marks after 20 race weekends have been counted and can now be revealed. And the summit of this particular table mirrors the 2017’s final Drivers’ Championship standings with world champion Lewis Hamilton (8.65) coming out on top from runner-up Sebastian Vettel (8.34), with the title rivals clear of the field. But behind that there is a change to the world championship order with Red Bull pair Max Verstappen and Daniel Ricciardo tied for third place – to two decimal places! The race-winning pair have impressed amid regular bouts of car unreliability in 2017 and both averaged scores of 7.97. And, showing that it’s possible to still catch the eye in uncompetitive machinery, Fernando Alonso was fractionally behind the Red Bull duo with the fifth-best average (7.92) for his efforts during another trying year at McLaren. Abu Dhabi race winner Valtteri Bottas was sixth (7.5) with Force India’s Esteban Ocon (7.42) and Sergio Perez (7.38) as closely matched as they were on track and rounding out the top eight, although it was the Frenchman who ended the year with a marginally higher average score in his first full season of F1. But who is YOUR driver of 2017? That’s what our driver ratings say, but we’re opening up the vote to you in the poll below to select the driver you believe has performed best in 2017. With nods to super-subs Jenson Button, Paul Di Resta and Antonio Giovinazzi, we’ve listed in the poll the 22 drivers who for all, or part, of the year have been considered full-time drivers. Cast your vote and then keep checking back to see how the percentages are staking up! Previous : VOTE: Who do England fans want in the World Cup group stage?